“Healthy beer recipe” may sound too good to be true, but it’s not. Here are 7 ways to cook with your favorite alcoholic beverage. When planning a balanced diet, beer can get a bad reputation for being high in carbs and low in nutrients (and the alcohol doesn’t help, either). But that doesn’t mean there’s no place for America’s favorite beverage in your meal plan. Instead of downing pint after pint at the bar, you can enjoy an amazing ale or lager with dinner in a whole new way. Beer can be added to a variety of recipes to add a depth of flavor, infusing meat, vegetables, and bread with the subtle notes of the best craft brews. Most of the alcohol cooks off and and once you get a handle for these preparations, you’ll be able to get creative with mixing together your pint of choice with everyday foods to get a meal that’s way more than the sum of its parts. It’s time to put an end to Brussels sprouts stigma in the name of good health, and what better way is there get past that food aversion than to drown them in beer? The Stone Pale Ale (or your favorite IPA) will cut through the potentially unpleasant bitterness of the sprouts with a crisp citrus note. Pancetta and Parmesan complete this side dish with crave-worthy flavors. 1. Set up a steamer with 1 to 2 inches of salted water and bring the water to a rolling boil. Put the Brussels sprouts in the steamer, cover, and cook until slightly tender, about 4 minutes. Drain and immediately transfer the Brussels sprouts to a large bowl of ice water to halt the cooking and preserve their bright green color. Let them cool in the ice water for about 1 minute, then drain. Lay them on a clean dish towel and pat dry. Cut them in half vertically, right through the core. 2. In a large wok or cast-iron skillet, heat the oil over high heat until it begins to shimmer. Turn the heat down to medium. Add the pancetta and cook, stirring occasionally, until it begins to brown. Stir in the garlic and cook until fragrant, about 30 seconds. 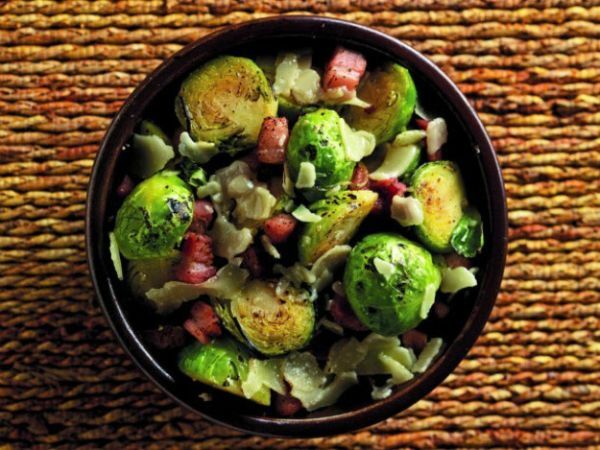 Turn the heat up to high, add the Brussels sprouts, and cook, stirring occasionally, until lightly browned, 4 to 5 minutes. 3. Add the beer and continue to cook over high heat until the liquid is mostly evaporated. Deglaze the pan by adding the vegetable stock, stirring and scraping up any browned bits that may be affixed to the pan. 4. Season with salt and pepper to taste. Garnish with the tomato and Parmigiano-Reggiano. Serve immediately. Known as The Beeroness, Jacquelyn Dodd is not only a recipe developer but a master when it comes to integrating all kinds of beer into inventive recipes. 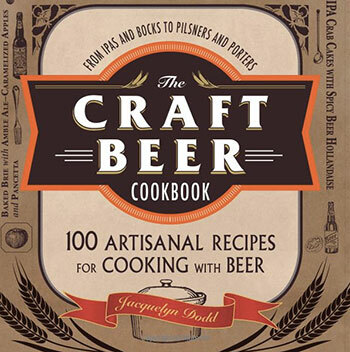 That makes her collection – The Craft Beer Cookbook: From IPAs and Bocks to Pilsners and Porters – a must-have for every beer lover’s kitchen. It includes 100 artisanal recipes like beer grits with goat cheese and chives, smoky beer mac & cheese, and vegetarian mushroom stout sliders with chipotle cream. 1. In a skillet over medium-high heat, add the olive oil. Sauté the red bell pepper and onion until softened, about 5 minutes. Add the garlic to cook for about 30 seconds. 2. Add the ground pork and chorizo, cooking until browned. Throughout the cooking process, break the meat into smaller pieces. Once the ground meat is nearly cooked through, drain off most of the grease that has accumulated. 3. Add the stout, tomato paste, cumin, and black pepper. Stir, and simmer until everything is cooked through, another 10 minutes. 4. 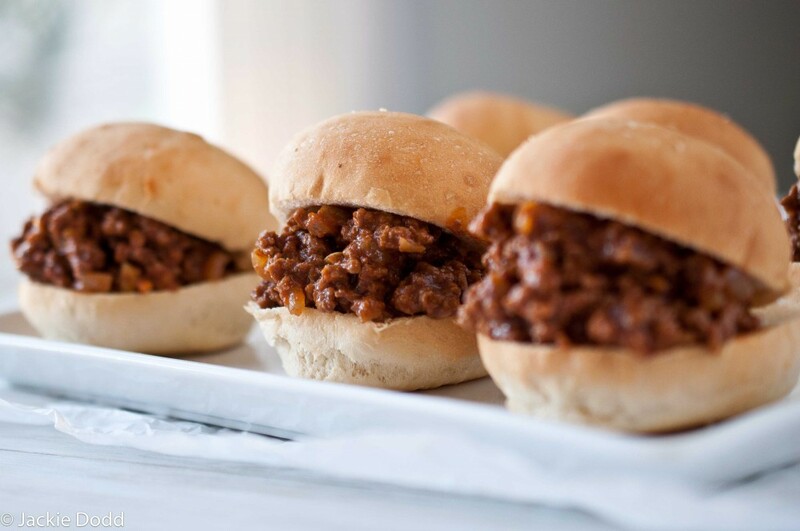 Place the sandwich buns on a baking sheet, and toast in the oven or a toaster oven. 5. 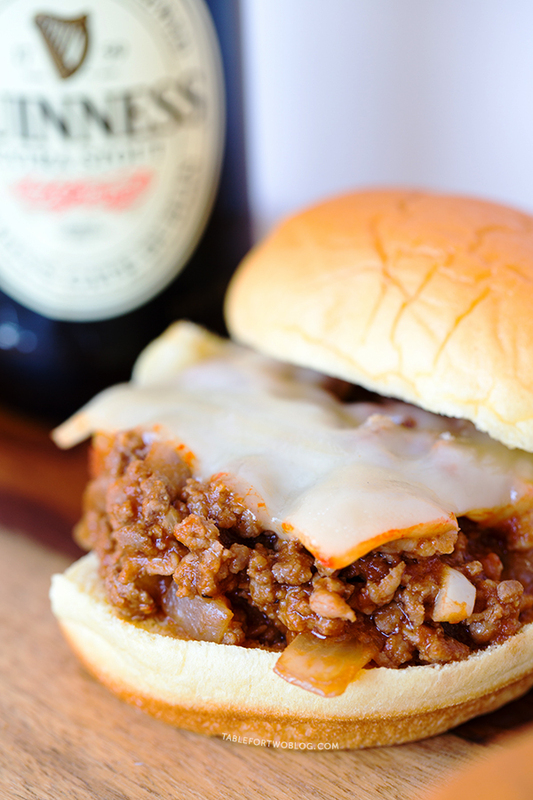 Scoop meat into buns, cover with cheese, and put the top of the bun on. Repeat on all 8 sandwiches. Serve immediately. Beer? Salad? Yes, the two can go together – and not just by placing a pint glass next to the bowl. 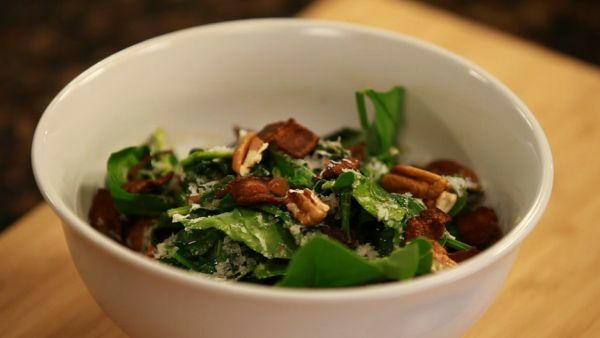 This salad is macho with beer and bacon, but you can dial down the fat with turkey bacon. 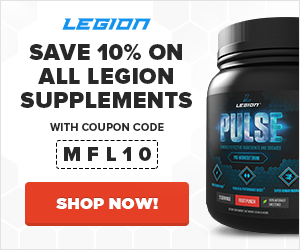 Serve alongside grilled chicken for a lean protein. 1. In a large wok (or skillet) over medium heat, add the little bit of oil and cook the bacon. Stir occasionally, until browned and crisp, 6 to 8 minutes. 2. Transfer bacon to a paper towel-lined plate. Pour off all but 3 tablespoons of fat from the skillet. 3. Add onion to the wok. Cook, stirring occasionally, and after a couple minutes add the shallots. Stir, and add the garlic, lemon zest, and chili flakes. Don’t add everything at once – give each a chance to cook a bit in between. Cook until crisp-tender, about 5 to 7 minutes. 4. To the pan, add apple cider vinegar, ale, and brown sugar. Simmer until the liquid thickens slightly, about 1 to 2 minutes. 5. Now either add spinach to the wok, or choose to pour the mixture over the spinach in a bowl. Either way, wait until the spinach wilts slightly and gets a little warm. Toss quickly to coat the spinach. 6. Season to taste with salt and pepper. Sprinkle with bacon and grated cheese. Don’t skip this one just because it’s tofu. Not only is this delicious and easy-to-make, but it’s a good go-to recipe for when you invite a vegan or vegetarian to dinner. And thanks to the addition of beer, there’s no doubt it’ll become one of their favorite comfort foods. And it could become one of your favorite dinners too! 1. Thoroughly press the tofu before marinating. Cut each block of tofu into 8 slices, and place on top of clean dish towels (or paper towels). Wrap, and stack something heavy such as cans or books on top. Leave for at least a half hour. 2. In a casserole dish, combine the beer, barbecue sauce, garlic cloves, and ginger. Lay the pressed tofu slices in the marinade, and let sit in the fridge for an hour and a half. 3. Prepare the grill to medium-high heat (about 400°F), and brush the grates liberally with oil to ensure the tofu doesn’t stick. 4. Place the tofu slices on the hot grill, close the lid, and leave to cook for 6 to 9 minutes. Once the tofu is easy to lift with a metal spatula and appears nice and charred, you’re good to flip. Before closing the lid to cook for another 6 to 9 minutes, brush/pour the leftover marinade on top. 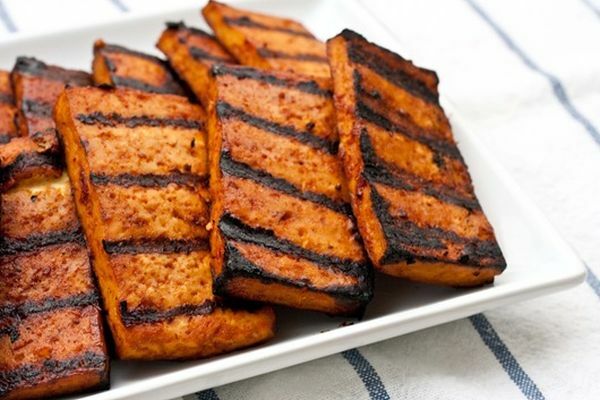 There should be nice grill marks on each side of the tofu when it’s done. Basic beer bread couldn’t be easier. It only requires five ingredients: flour, sugar, melted butter, salt, and of course your favorite brew (or just a bottle you want to get out of your fridge). Since you’ll only need a few minutes to measure and mix the beer batter together, it’s a cinch to build on the base with any flavors you choose, such as fresh herbs. 1. Preheat the oven to 375°F. Prepare a muffin pan with paper liners or parchment paper squares. 2. In a large bowl, whisk together flour, sugars, baking powder, baking soda, and salt. 3. Make a in the center of the flour mixture and add beer and grapeseed oil. Stir only a few times then add lemon zest and herbs. Stir lightly just until combined and herbs and zest are mixed throughout the batter. Avoid over mixing to keep the batter light and fluffy. 4. Fill muffin cups about 3/4 full. 5. In a small sauté pan over medium heat, add 1 tsp. grapeseed oil. Add the raw sunflower seeds and a pinch of salt to the pan to lightly toast, about 2 minutes, just until they become a light golden color. Keep a close eye because the seeds will burn quickly. 6. 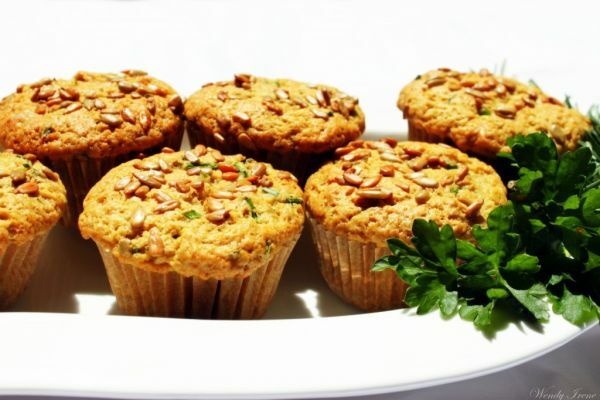 Using a spoon or when the seeds have slightly cooled, sprinkle a few seeds on the top of each muffin. 7. Bake for approximately 20 to 25 minutes. Remove from the oven, and after a few minutes, transfer to a wire rack to cool. 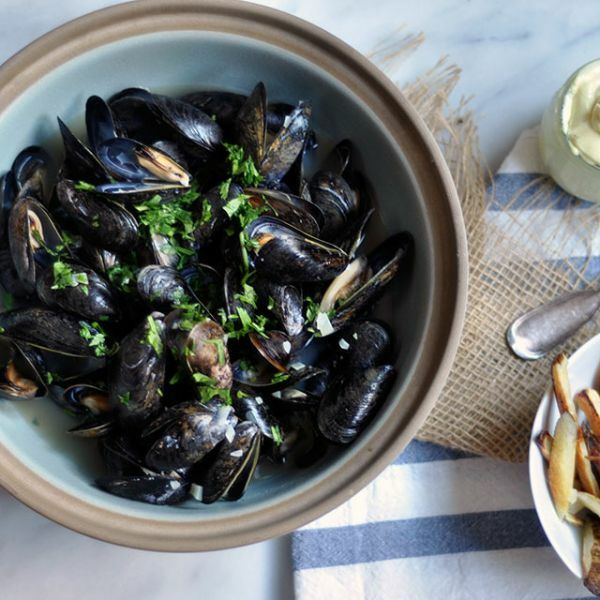 This couldn’t be easier to make, and if you love shellfish, you’ll be rewarded with a unique spin on a favorite dish. This makes a great appetizer to serve four, but it can also be a wonderful main course for two. Serve with crusty bread, such as a sourdough. 1. Add the beer and shallot to a large saucepot. Bring to a slow boil over medium-high heat. 2. Add the mussels, cover, and steam until all the mussels have opened. Toss any that don’t open. 3. Divide mussels and broth among bowls. Sprinkle with cilantro, and serve. Despite all the debate, there’s no wrong way to make chili – with or without beans, with ground beef or chicken, mild or spicy. One of the many variations of this classic American comfort food is seasoned with cocoa powder, but you can turn it up a notch with a chocolate-infused beer. 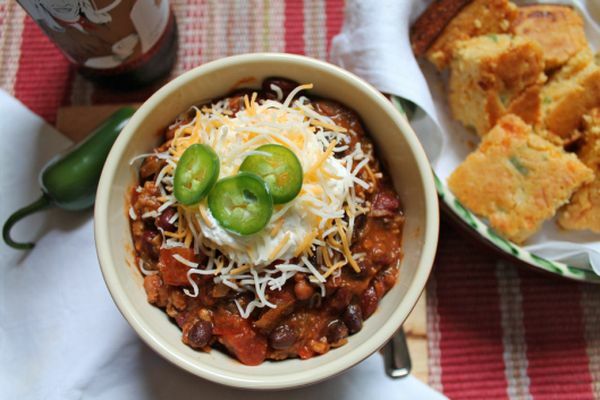 Then, of course, the topping possibilities for chili are just as endless as the ways to make it. Stick to the basics like cheddar and sour cream for this one so as not to overpower the fullness of the stout. 1. In a large pot, sauté the onion, red bell pepper, and jalapeno until soft. Add the garlic, cooking for another minute, and then push the ingredients to the outside of the pan. 2. To the space in the middle of the pan, add the ground turkey. Season generously with salt and pepper, and cook until the meat is no longer pink. Add the chili powder, cumin, coriander, paprika, and chipotle powder. Stir all together. 3. Pour in the beer, and let most of the alcohol cook off. Add in the tomatoes, chipotle chilis and adobo sauce, green chilis, and beans. 4. Bring everything up to almost a boil, and then simmer for about an hour, partially covered. What did you think of these healthy beer recipes? Have anything else to share? Let me know in the comments below!